The Spring Butterfly Card Panel die measures approximately 3.65" x 4.875", which will cover most of a standard card front, while still leaving you with a nice sized border to add some layering. The detailed Spring scene features a meadow of flowers and butterflies. Tattered Lace Die - Flutterby Butterfly. Tattered Lace Dies are the most detailed and delicate dies on the market. They are beautifully co-ordinated with a distinctive look and can be standalone or used to complement existing dies in your collection. Tattered Lace Flutterby Butterfly features a beautiful butterfly with delicate, swirl designed wings. Perfect to add to your spring and summer time craft collection. Ideal for many different occasions, this butterfly would look perfect on invitations and crafts for extra special occasions such as Weddings and Anniversaries. This die would look great framed by an Essentials Swirl Edge shape from this Desert Rose Collection. Tattered Lace dies have a non-stick coating that allows the card to release without the need for wax paper or tumble dryer sheets. Use with a variety of different card, fabric and materials to create stunning effects for your cards, home decor and scrapbook pages. This die measures approx 3.90" x 2.68". Detailed and delicate, Tattered Lace Dies are the most intricate dies available. This topper die gives you the perfect finishing touch to all of your projects. 3 dies. Sizes: Card: 2.91" x 3.54", Butterfly 1: 1.02" x 1.02", Butterfly 2: 0.75" x 0.75". Craft dies featuring butterflies. Compatible with most die-cutting machines. Marianne Design Creatable - Anja's Butterfly. A great doily and frame set with an additional butterfly embellishment. With a very nice open design fits onto the MB cutting sheets. 4 dies. Sizes: Smallest: 1.50" x 1.60", Largest: 5.12" x 5.24". This tool can easily punch flat, hand held or upside down. It can cut through paper, thin foam, vellum and cardstock up to 300gsm. Craft dies featuring Butterflies. Work with any manual die cutting machine. Use with a magnetic base plate and die cutting plate. The butterflies are around 1/2" - 3/4". These dies are compatible with most tabletop die cut machines. Additional shims may be necessary and some machines handle the detail level better than others. These are US-made steel dies compatible with most table-top die cutting machines. This is a single die measuring 3 x 3-1/2 inches. Crafty-Ann craft die featuring a butterfly. Size: 4 3/8" x 2 5/8" (110mm x 66mm). Crafty-Ann craft die featuring a butterfly. Size: 4 1/4" x 2 3/4" (108mm x 69mm). Marianne Design Creatable - Butterfly Border. The butterflies fit on the beautiful border to make a unique design on your card or layout. 3 dies. Size: 5.39" x 3.66", 1.26" x 0.94", 1.10" x 0.83". The Confetti Butterfly Large Punch from EK Tools features several butterflies in various sizes. Craft die featuring a butterfly. CottageCutz are thin metal dies, like a QuicKutz. They are easy-to-use and add great detail to any craft project. They are compatible with most brands of die-cutting machines. Adapters and shims may be required on some machines. Use with paper, cardstock, vinyl, vellum, adhesive-back paper and more. Made in the USA and 100% lead-free. Craft die featuring Floral Eggs and Butterflies. CottageCutz are thin metal dies, like a QuicKutz. They are easy-to-use and add great detail to any craft project. They are compatible with most brands of die-cutting machines. Adapters and shims may be required on some machines. Use with paper, cardstock, vinyl, vellum, adhesive-back paper and more. Made in the USA and 100% lead-free. Cut and Lift dies are designed to cut partial shapes from your projects, so they can be lifted off the page to create dimension. This die set is designed by Lisa Horton. This set includes 10 dies that will produce 3D butterflies. Size: (Largest) 2.7 x 2.2in (Smallest) 1.3 x 1in. Cut and Lift dies are designed to cut partial shapes from your projects, so they can be lifted off the page to create dimension.This die set designed by Lisa Horton includes 17 dies perfectly coordinated to work perfectly together to make beautiful floral shapes and a butterfly. Size: Smallest 0.55 x 0.55 inches, Largest: 1.65 x 1.65 inches. Darice Embossing Essentials Die featuring butterflies. Cut shapes, emboss detail into die-cut shapes and stencil through the die for added effects! Compatible with the Provocraft Cuttlebug, the Quickutz Revolution, the Craftwell eBosser, the Sizzix Big Kick and the Sizzix Big Shot (each sold separately). This package contains one die-cut embossing stencil. Add a touch of cheerful whimsy to all of your handmade greeting cards, altered art pieces, and scrapbook layouts with the Butterfly Dreams Border Die! Pair with the coordinating cling stamp set to create dreamy, butterfly filled border embellishments! Also pairs perfectly with the Fleur Border Basics Die for layering! Beautifully designed, these borders are ideal to use as delightful accent pieces on their own, or as layering elements perfect for displaying your favorite dimensional flowers! Approximate Image Sizes: 1. Butterfly Border 1: 6.0" x 2.25", 2. Butterfly Border 2: 6.0" x 2.0". Intricate die cuts are quick and easy layering pieces that add instant elegance to all paper craft creationsand the delicately detailed dies found within the Butterfly Kisses Decorative Die are no exception! A striking square accent featuring ornate corners, a fanciful and lace like doily, a whimsical butterfly, along with a beautifully scripted thank you sentiment round out this regal collection of decorative dies that is guaranteed to become one of your all-time favorites! Approximate Image Sizes: 1. Butterfly Accent: 2.5" x 3.75", 2. Ornate Square: 4.0" x 4.0", 3. Fanciful Doily: 3.25" x 3.25", 4. Fanciful Doily Centre: 1.25" x 1.25", 5. Scripted Thank You Sentiment: 1.25" x 1.5". Lose yourself in a wonderful daydream as your creativity takes flight with the Fluttering Butterfly Die! When paired with the coordinating cling stamp set, creating layered and dimensional butterfly embellishments is effortless! Ideal for a multitude of occasions, this die is one that will surely be used over and over in the years to come and is the perfect way to add a soft and dreamy feel to all of your paper crafting creations! Approximate Image Sizes: 1. Fluttering Butterfly Base 1: 3.25" x 4.0", 2. Fluttering Butterfly Base 2: 3.5" x 4.0", 3. Intricate Fluttering Butterfly Layer 1: 3.25" x 4.0", 4. Intricate Fluttering Butterfly Layer 2: 3.0" x 2.0". Every woodsy forest scene calls for those little adventurous touches and wildlife surprises that you might encounter as you explore softly trampled wildlife trails! Dimensional fallen tree stumps, beautiful blossoming wildflowers and rough and rocky terrain are easily accomplished with this assembling of Woodsy Wonderland dies. Paired with the coordinating cling stamps, creating these charming embellishments is easy and will bring a realistic touch to all of your woodland projects. And no forest would be complete without delicate fluttering butterflies and a few woodland creatures making an appearance! These dies are part of the Woodsy Wonderland Collection and pair with the Woodsy Wonderland Cling Stamp Set. Approximate Image Sizes: 1. Rock Filled Landscape: 4.0" x 1.25", 2. Flitting Butterflies: 1.5" x 1.25", 3. Prancing Skunk: 1.25" x 1.25", 4. Raccoon Rascal: .75" x 1.25", 5. Blossoming Wildflowers: 3.75" x 1.5", 6. Fallen Tree Stump: 4.0" x 2.0". Joy Crafts - Cut-Emboss-Deboss Die 3D - Butterfly Border. A beautiful butterfly border that would look great embossed and then add some gilding wax or polish on the embossed areas! 2 dies. Sizes: 5.94"x1.77" and 5.87"x1.69". 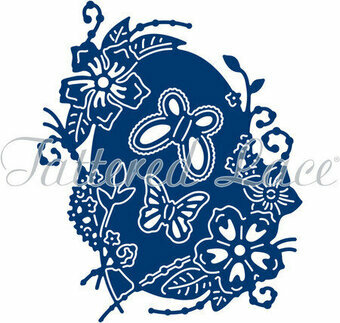 This circular floral and butterfly die creates a great background for all kinds of projects. Includes 3 dies. Size: 4.75 x 4.75 inches. 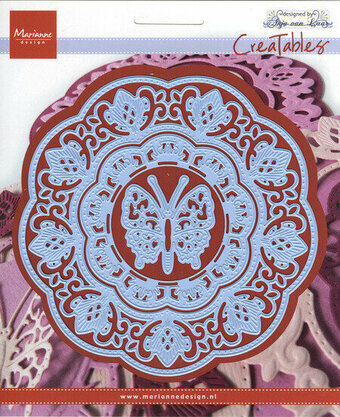 Nellie's Choice - Hobby Solutions Die Cut "Butterfly-1". This large butterfly will make a lovely addition to any project. Experiment with different colours and textures to create beautiful butterflies. Size: 3" x 2.75". Shape Dies Summer "butterfly". An oval scene with flowers and butterflies. 1 die. Size: 3.5" x 4". Craft die featuring a butterfly collage. Memory Box/Poppy Stamps craft dies are made of 100% steel. For use on cardstock, felt, and fabric. Cut, stencil, emboss, create! Use in most leading die cut systems. 3.1 x 2.3 inches. Stamp and Die set from Sara Davies featuring a butterfly. Craft dies from Sara Davies featuring borders with butterflies. Craft dies from Sara Davies featuring a frame with butterflies. Craft dies from Sara Davies featuring butterflies. Sizzix Thinlits die featuring spring flowers, a bird, a butterfly, a heart, and more!